Several weeks before Neva came home with us, we began getting the whole house in order, reading our puppy and dog training books (different methods than when we trained Kaweah), and trying to get a jump on our workloads. Let me tell you – since she came home: the entire house looks like a giant puppy playpen, we feel as if we’ve forgotten everything we read in the training books, and it seems that we are already falling well behind in work. It’s no doubt that part of the existence of Puppy Vortex is because I’m still sick – with bronchitis and no voice. Clearly, recovery is but a pipe dream on four hours of sleep a night. Neva was getting plenty of sleep and plenty of playtime. However, Wednesday morning she had an episode of trembling and lethargy that was sudden and extremely uncharacteristic. Even worse? She refused food. My stomach dropped. There was only one time ever that Kaweah refused food, and that was the morning we said good-bye to her. I fought back tears and asked Jeremy to call the vet for an appointment. Neva was running a low fever and our vet prescribed some meds and asked us to call him in the morning for a status report. Almost as quickly as she had gone downhill, she bounced back within hours to her normal puppy self – biting everything in sight, romping around clumsily, and wanting to explore the whole world. Despite the setback, we’ve been introducing Neva to new things. She loves the vet’s office as well as my neighbor’s daughter. She completely goes bananas for plain yogurt and peanut butter. And she loves snow. 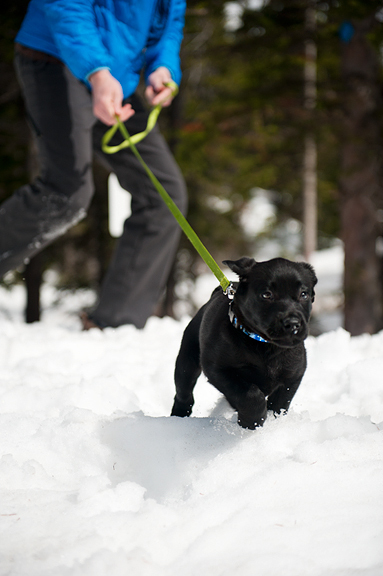 Since we still have lots of snow in the high country, we took her for her first introduction this week. Despite feeling truly crappy right now, I don’t want to get into the habit of punting each post by tossing up a bunch of puppy pics and calling it good. 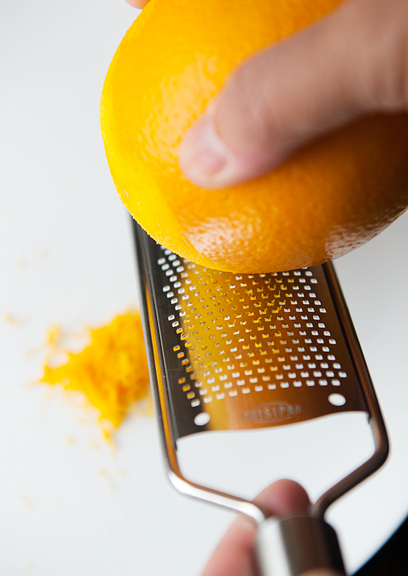 You good people deserve a recipe, and this one is awesome. It comes from my friend, John of Food Wishes, and I was inspired to make it after ordering a Grand Marnier soufflé at a French restaurant in Williamsburg, Virginia. I served mine with a Grand Marnier crème anglaise (also from John’s site). I just don’t see how it can get any better! 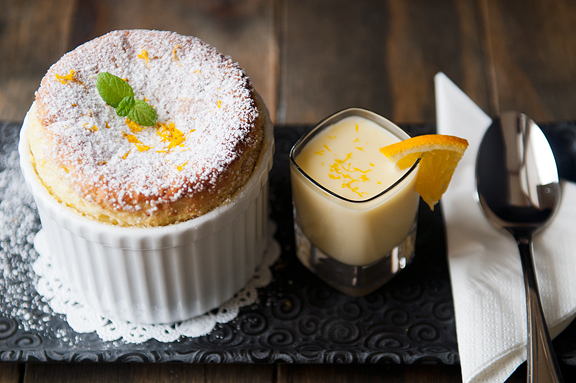 If you decide to serve the soufflés with a side of crème anglaise sauce, you should start the sauce a few hours earlier than the soufflés to give it time to cool. 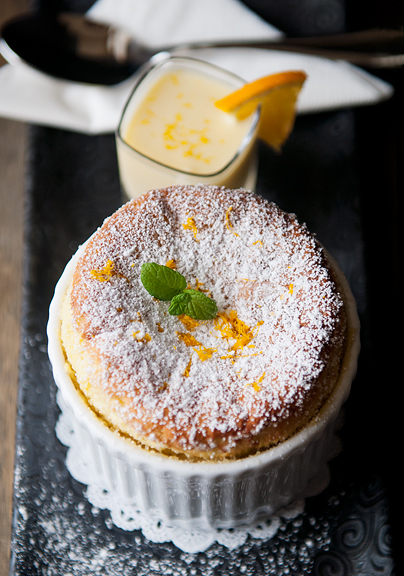 You can make the crème anglaise up to 3 days in advance, which takes some of the pressure off of making soufflés. The soufflés must be prepared right before serving because they start falling within moments of removing them from the oven. John used 7-ounce ramekins and I used 8-ounce ramekins. He had leftover batter and I came up short on one of my ramekins. I think the volume of your batter is going to vary greatly with the size of the eggs, how the whites are whipped, and how much the whites deflate when you fold them into the batter. So if you are making this for a specific number of desserts, err on the side of caution and perhaps aim for making more than planned. The whole process of making the soufflés takes no more than 15-20 minutes – not including baking time, assuming you know your way around the kitchen and are relatively organized when it comes to mise en place. 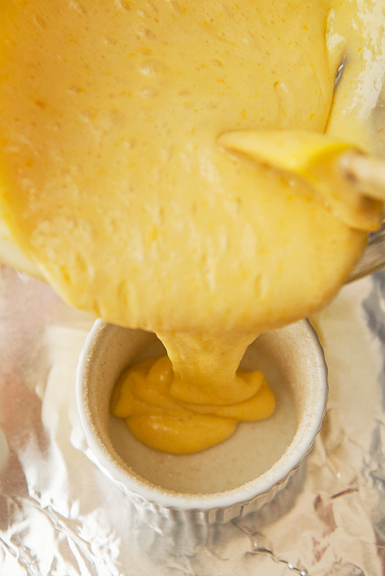 It starts with a roux and mixes in milk and flavorings and egg yolks for a thick and creamy base to the batter. I did attempt to make this part of the recipe ahead of time once and didn’t really like the resulting texture of my soufflés, so in the future I’ll just make them right before serving. 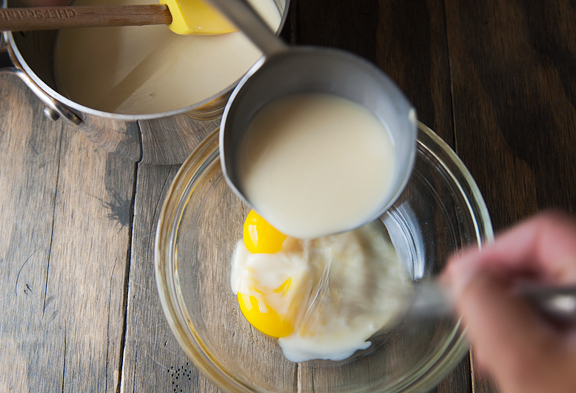 When the base of the batter is ready, start whipping the egg whites. Take care not to succumb to the temptation of overwhipping the egg whites. The whites should flow from the whisk as you lift it out of the bowl and fall as ribbons that hold their shape for several seconds. It shouldn’t break (overwhipping) or flow like liquid (underwhipping). Next, fold half of the whites into the batter. 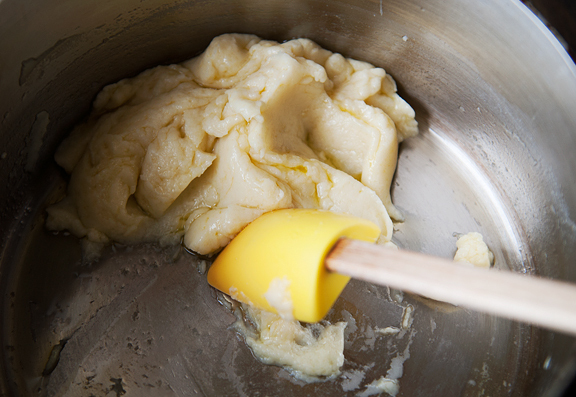 Because the batter is so thick, if you added all of the whites at once, you’d deflate that hard work you (or your mixer) did to whip them all fluffy and airy. 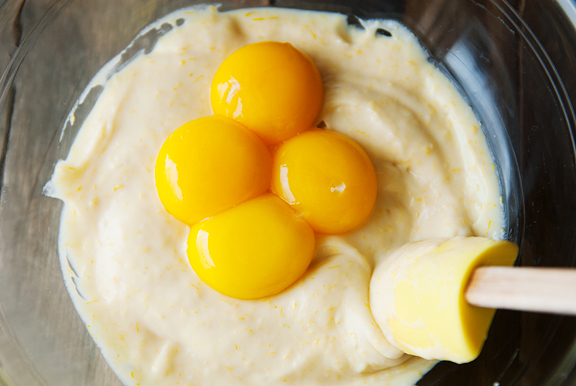 By adding half of the whites to the batter, you lighten up the batter while sacrificing some of the egg white volume. But when you fold in the second half of the whites, they will retain more of their volume so the little air bubbles can do their job and make the soufflés rise. 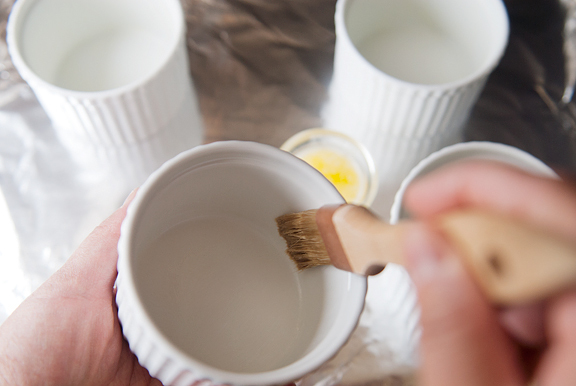 Right as you finish folding in the rest of the egg whites, begin filling your ramekins with batter. Some folks say fill them just under (like 1/4-inch) the rims and others say to fill them to the top. I like filling them just to the rim, but at my elevation, some of them disembowel over the sides – not all, but some did. The goal is to allow the soufflés to rise straight up without getting snagged to the ramekin on the edges. The butter and sugar coating on the ramekins help enable that clean rise. 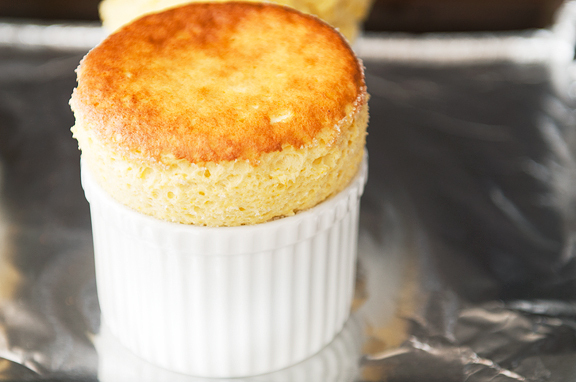 The soufflés are done when the tops are browned and the dessert has risen well above the rim of the ramekin without toppling over (even if it topples over, it is delicious). You must serve these babies immediately out of the oven because for every moment you dawdle, each one loses a little of its glorious height. The soufflés have a nice delicate crust on top and where the sugar lined the ramekins, but the interior is pure pillowy eggy goodness. While delicious on their own, they are something else entirely when you serve them with a chilled crème anglaise. It’s got that hot and cool thing going as well as a nice kick from the Grand Marnier. So if your goal is to impress, this might be your ticket! awww, i can’t say no to you! 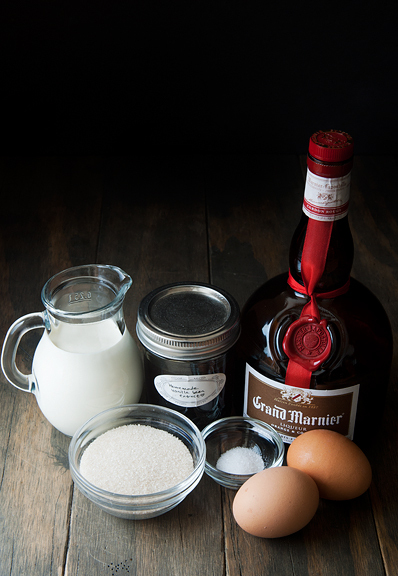 Make the Grand Marnier crème anglaise: In a small saucepan, stir the heavy cream, sugar, and salt together over medium-high heat to dissolve the sugar. When the cream starts to boil at the edges, remove the pan from the heat. 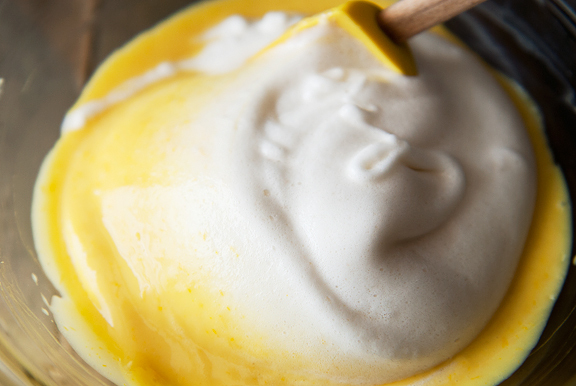 Whisk the egg yolks in a medium bowl and slowly whisk in half of the hot cream mixture. 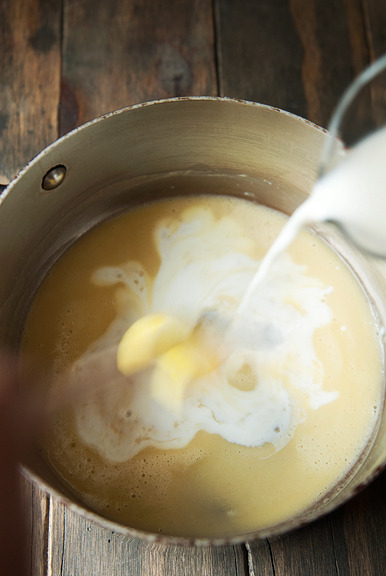 Whisk that cream and egg yolk mixture back into the saucepan with the remaining cream and set the pan over medium-high heat. 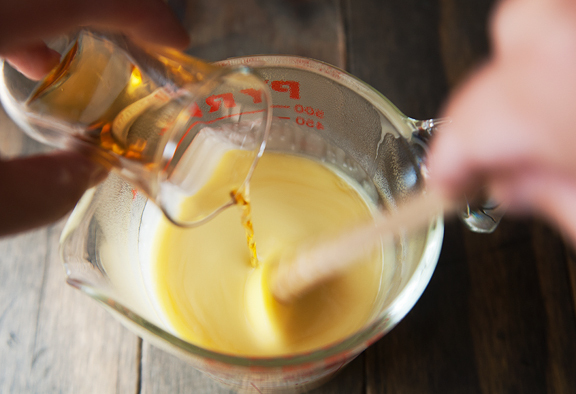 Stir constantly until the custard thickens and coats the back of a spoon. 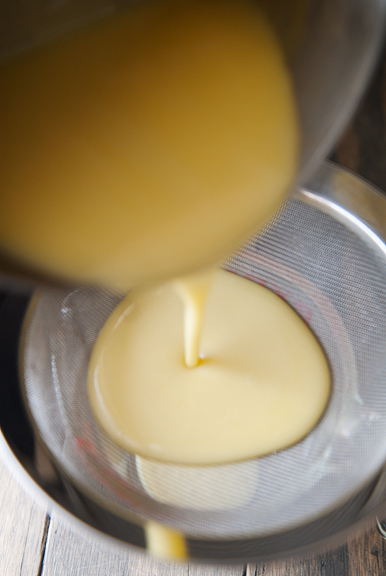 Remove the custard from the heat and strain it through a fine-mesh sieve. Stir in the Grand Marnier and the vanilla extract. Chill the crème anglaise completely. Makes 1 cup. 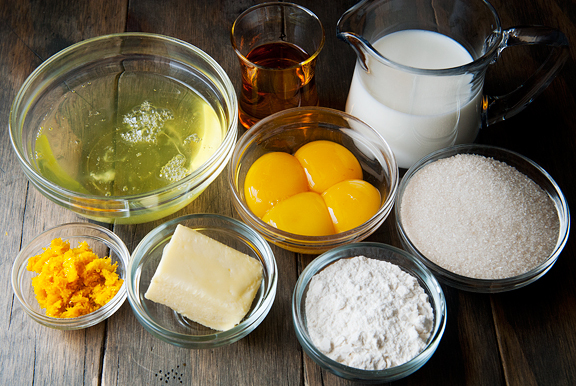 Make the soufflés: Butter four 8-ounce or 7-ounce ramekins and coat the insides with 2-3 tablespoons of granulated sugar. Shake out any excess sugar. Set the ramekins on a baking sheet lined with aluminum foil. 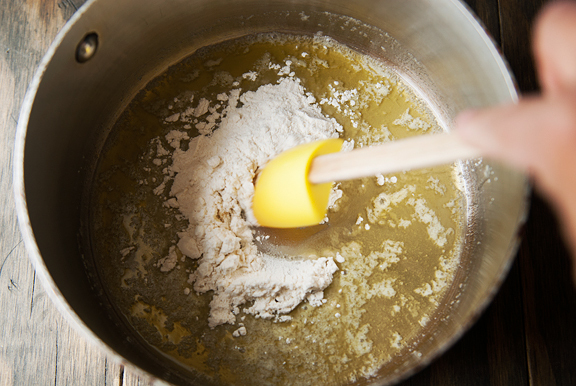 Melt the 3 tablespoons and 1 teaspoon of butter in a medium saucepan over medium-low heat. Stir the flour into the melted butter and cook over medium-high heat until the mixture turns golden brown and becomes fragrant. This takes about 2 minutes. 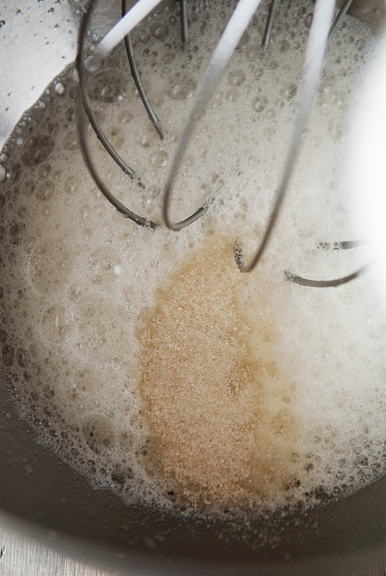 Pour a little of the cold milk into the flour mixture and stir until it is completely incorporated. 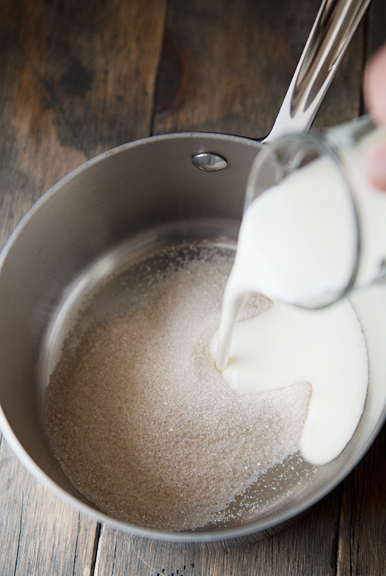 Continue doing this until you have added all of the milk and the mixture is smooth and thick (about 3-4 minutes). 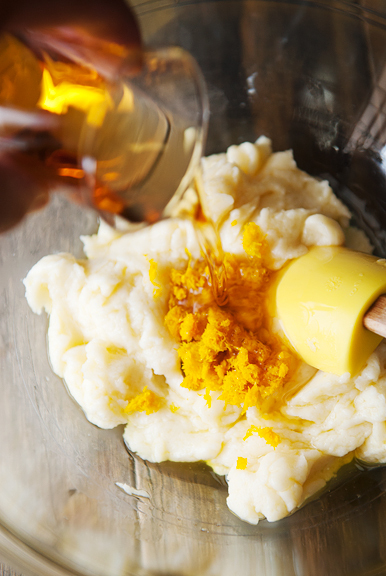 Place the doughy mixture in a large mixing bowl and stir in the orange zest and the Grand Marnier until completely combined. 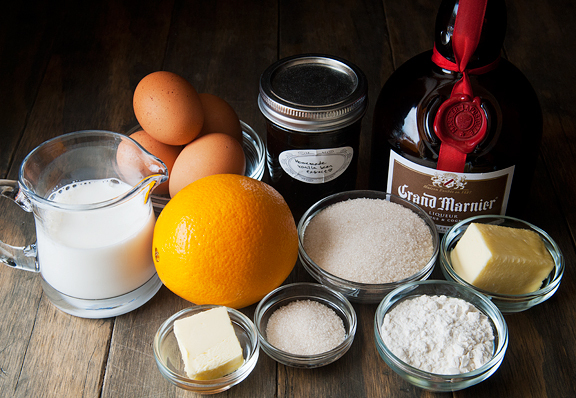 Mix in the yolks and the vanilla extract until smooth. Preheat the oven to 400°F. 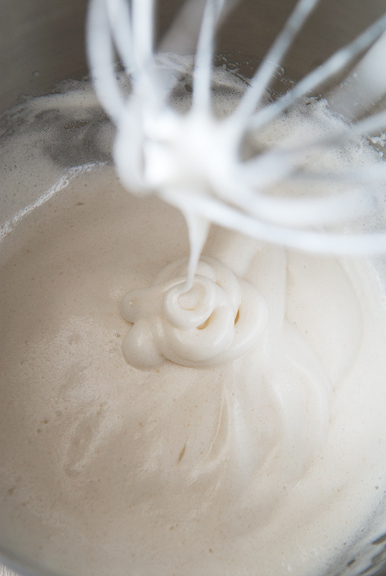 Beat the egg whites until they are frothy. 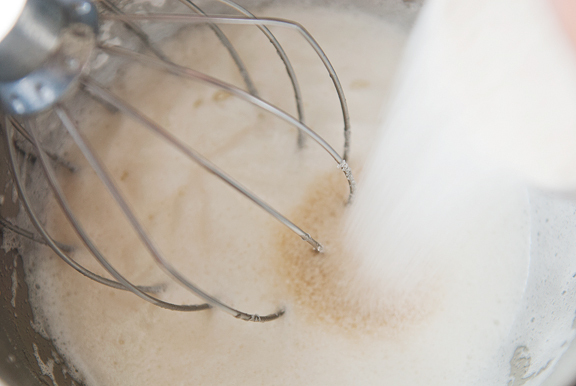 Slowly add half of the granulated sugar while whipping the egg whites. 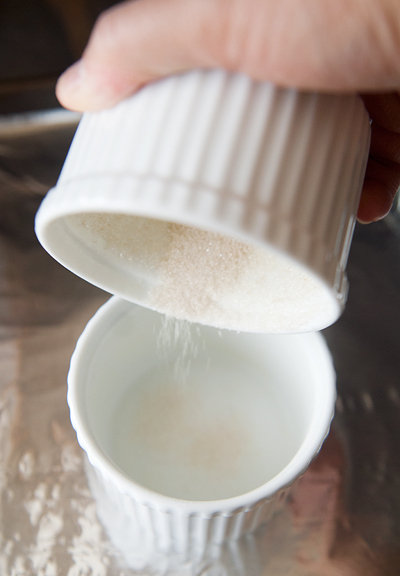 Pour in the rest of the granulated sugar and whip the whites until they are thick, but not stiff. It should leave a ribbon on itself that holds for ten seconds or longer. 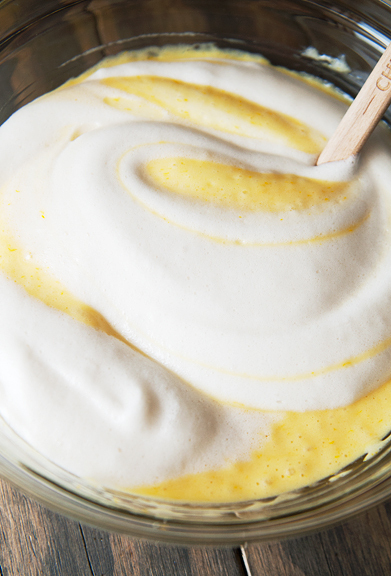 Mix half of the whipped egg whites into the egg yolk mixture until evenly combined. Gently fold the remaining half of the egg whites in, taking care not to deflate the batter by overmixing. Pour the batter into the ramekins until they are level with the rims. Wipe the inside edges of the rims with your finger (no more than 1/4-inch down) – this is supposed to help the soufflés rise straight up. Bake for 16 minutes until risen and browned on top. These should be served immediately with a dusting of powdered sugar and a side of Grand Marnier crème anglaise. Serves 4. Gratuitous puppy pics gratefully received. The soufflé looks outstanding. And we love your recipes too! (Okay and photos and everything else – but never worry about too much pup! I was happy with the puppy pictures, but am also happy to have this to look forward to. I’m glad Neva bounced back so quickly, and hope that you are well soon too! oh mine, I don’t know what’s best, souffle or puppy eyes! feel better soon! Am ok with just puppy pictures!! Always love your recipes, but so happy to hear about your new adventures! Sorry you’re not feeling well, sending you good thoughts! I do like your food posts but I LOVE your dog posts. Neva is crazy cute. 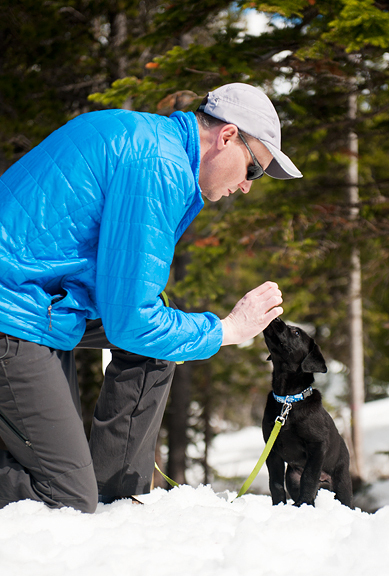 What is it about lab puppies? Only an idiot could resist them. I’m so happy for you & Jeremy! Feel better soon. Her sweet face! No such thing as puppy pic overload. She is adorable! 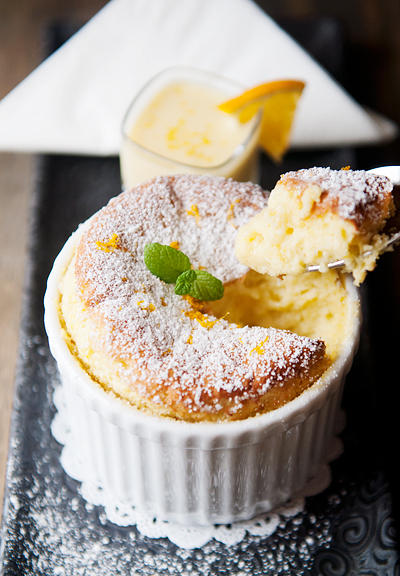 The souffle looks amazing! Now let’s talk about that sweet face! I will miss Kaweah stories, but look forward to seeing little Neva grow. True confessions: soufflé making intimidates me. Maybe it’s the now or never aspect of it all, my heart would sink as the dessert started going down. Thanks for taking the mystery out of it and making it seem possible. 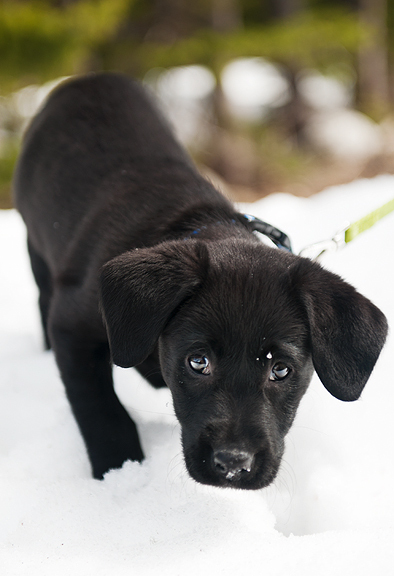 Oh, we wouldn’t mind a puppy only post, keep ’em coming, she’s so, so cute! Omg – how you could make such a beautiful obviously delicious recipe while sick, while sleep-deprived, deep in the midst of puppy training is beyond me! Bravo! 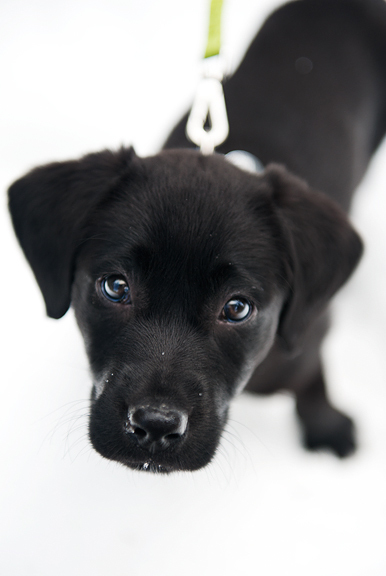 I have a better chance of getting a puppy (5%) than of ever making a souffle (0%) — LOL! Happy to see as many puppy pics as you care to post! Your blog updates are like a little present. I love seeing them in my inbox. Your pictures and stories and recipes are beautiful! There’s nothing wrong with just pup pictures especially when feeling terrible. Hope you feel better soon. Thamk you for sharing with all of us. Neva sounds like my son a little–spike a little fever, be lethargic for about 24 hours and then pop back with a vengeance after the rest of the household is worn down. 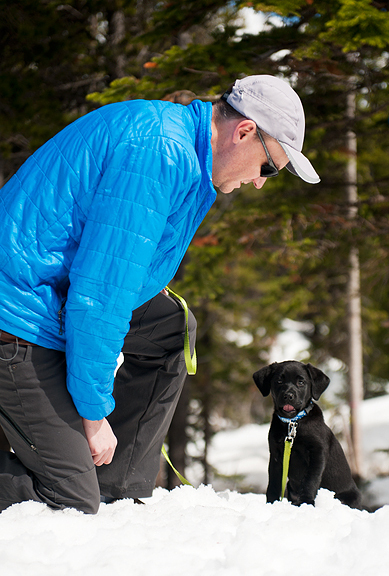 Puppies and babies–sometimes same/same! Neva is just too cute ! Never enough puppy pics ! I hope you will feel like yourself soon. Congrats to you and Jeremy. Oh that recipe has me captivated along with all the puppy pics!!! So happy you have a new puppy! When my chihuahua passed away last year I was reluctant to start over with a puppy and thought an older dog would be better for us. Well we ended up with a puppy with tons of energy that keeps us on our feet!!!! Hope you are feeling better by now…need a good doctor? So glad Neva bounced right back. OMG those eyes!!! Great photos and recipes you have here on your Blog. The puppy is cutest. My family is about to get a new puppy as well. It’s been about 2 years since our 14.5 year old husky passed. What training books would you recommend? Since we haven’t had to train a puppy for over 16 years I suspect all our methods are now outdated. Wow, she is so, so beautiful! I love looking into those sweet puppy eyes, even if it’s just through a photo. Please keep them coming! Lisha and Paige – see the next post to find out which books we’ve been reading for puppy training. Hope that helps! Jeremy wears an insulin pump? Cool! There is nothing sweeter than a Grand Marnier-infused soufflé together with a cute little puppy to warm one’s heart! The dessert is a show-stopper and a sure winner on the Thanksgiving/ Christmas table!